I’ve been so excited about posting this raspberry almond shortbread cookies recipe because it’s hands-down my favorite recipe of the year. It’s so very simple, but so amazingly good. These are just my kind of cookies, and they hold the spot as my favorite cookies to make during the holidays. I’m not sure why, but when I saw these cookies in Better Homes and Gardens, I wasn’t really inspired at first. I guess in my mind, thumbprint cookies are a bit boring. Boy, was I TOTALLY wrong on that one! 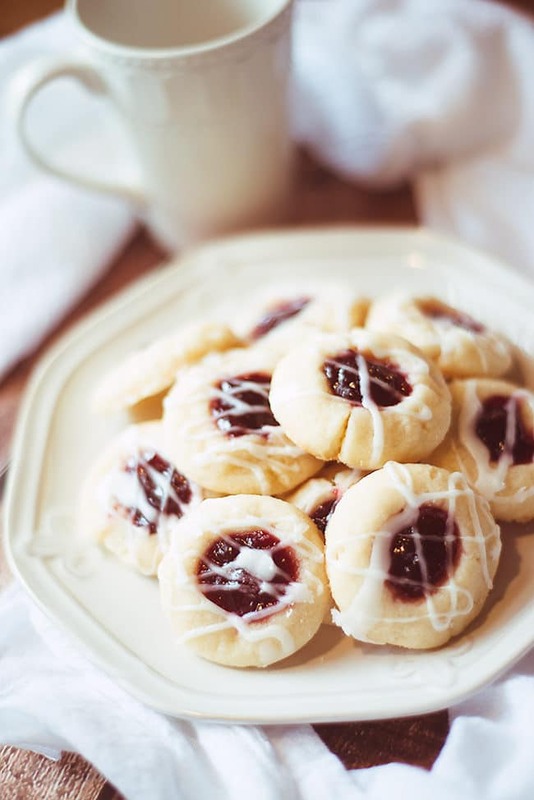 The texture of these beautiful little thumbprint cookies is perfect. They are a little crispy around the edges and super soft and chewy inside. The almond flavor is sweet and the cookies are delicious and buttery. 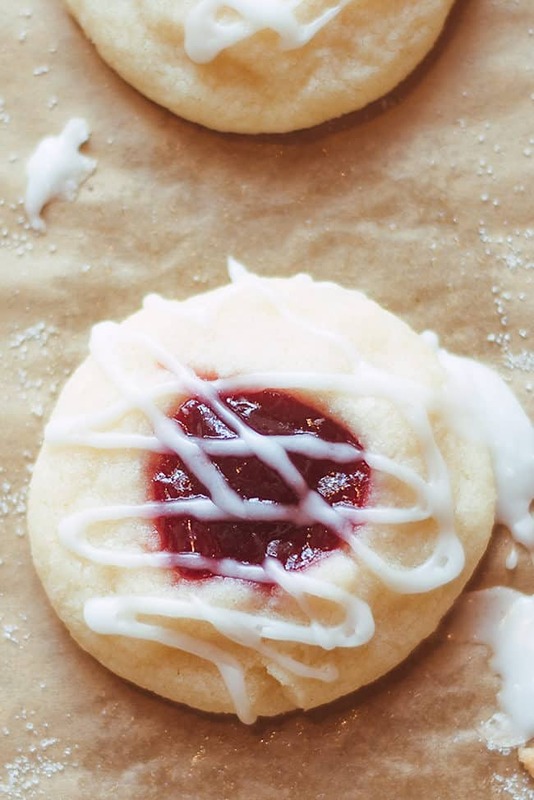 The sweet raspberry jam inside the cookies really sends them over the top and the sugary-glaze on top is divine. As much as I love chocolate, this particular cookie will win my vote every single time. I could eat an endless supply of them! 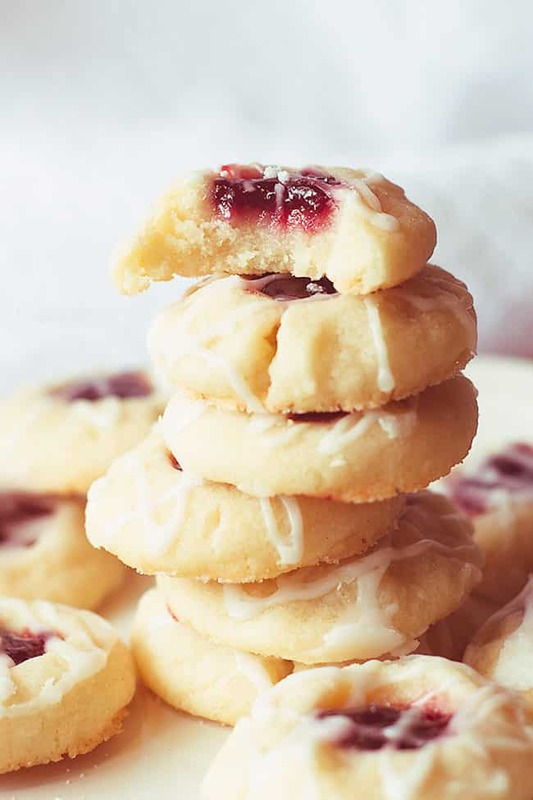 These raspberry almond shortbread thumbprint cookies are also just so pretty, delicate and festive. They look gorgeous arranged on a plate and really make the perfect holiday cookies. I know that I’m going to be making a huge plate of these cookies to take to my family’s annual Christmas dinner. Of course, I’ll probably end up eating half the plate of cookies myself! I hope your family enjoys these perfect little raspberry almond shortbread cookies as much as my family did! 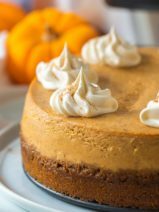 No matter how you ended up on this recipe post, please be sure to save it on Pinterest so you don’t forget about it later. 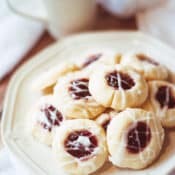 If you’re like me, you may think you’ll remember where you saw a certain recipe, but when it’s the night before the party and you’re trying to find that special raspberry almond shortbread cookies recipe to whip-up, you don’t want to have to waste a bunch of time trying to track it down. Trust me on this one, friends, it’s an amazing recipe. Like this post? Check out these wonderful Christmas recipes next! In a medium bowl beat butter medium speed for about 30 seconds. Add the the 2/3 cup granulated sugar and 1/2 teaspoon almond extract. Beat until well combined. Beat in as much flour as you can with electric mixer and then using a wooden spoon stir in any remaining flour. Cover and chill for 1 hour or until dough is easy to handle. Preheat oven to 350 degrees. Shape dough into 1-inch balls. Place balls 2 inches apart on ungreased cookie sheets. Using your thumb, press an indentation into the center of each ball. Spoon about 1/2 teaspoon of the jam into each indentation and then sprinkle with sugar. Bake about 10 minutes or until edges are light brown. Cool on cookie sheets for 1 minute. Transfer cookies to wire racks to finish cooling. For icing, in a medium bowl combine powdered sugar, 1 teaspoon water and 1 1/2 teaspoons almond extract. Add enough of the remaining water to make a drizzling consistency. Drizzle cookies with icing. Recipe via Better Homes and Gardens. Crissy, these cookies are definitely NOT boring!! In fact they are my new favorite. I am a chocolate lover but these surpass all my chocolate recipes. 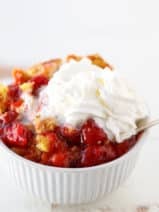 They are easy (fun) to make and all you need to do is follow the recipe as written and you get the best thumbprints I’ve ever had. Thank you for posting the recipe. I made the cookies dough last night and removed from fridg early this morning. Had to thaw a bit before I could form the cookies but once soft, it was easy to fill and bake. So very easy and they were delicious. I’m making them for a New Year get together as well. Thanks for this declicius recipe! The cookies taste great. However I wish I would have known that the cookie dough is of a coarse consistency. Even after refrigerating the dough I had to try hard to make into a ball. I use a honey wooden dowel spoon to make the indentation in the middle of the cookie dough. Then i pinched the coarse cookie dough around the wooden honey dowel spoon to form the base. I was shocked at the coarse consistency of the cookie just wished it had been mentioned on the recipe instructions. I thought I had missed an ingredient. 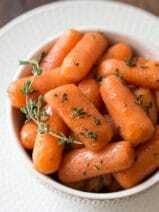 These hints my help someone else out how is trying this recipe for the first time. I felt like these would.have benefited from a little salt – did you all use salted butter? Very easy to make. Recipe only makes about 2 1/2 dozen, so if your making for a crowd you’ll need to double recipe. Delicious. I absolutely love these cookies and so does my family! I typically make them around the holidays. The only issue is that they always spread at the bottom leaving a brown thin crumbly edge instead of the lovely puffy sides in your photos. Any suggestions? I wont stop making them but it would be nice to have them be a little more presentable! Thanks in advance!! The issue is that they are spreading. Not that the bottoms are brown. Fabulous cookies, but a word of caution… DO NOT use Simply Fruit preserves…runs beyond the cookie and gets gummy! Love this recipe!! Delicious and easy! These are the best Christmas cookies! I made them last year to give as small gifts and EVERYONE loved them. I can’t wait to make them again!The recipe is also simple so you can’t go wrong! I have made these the last few years Everyone loves these and requested for cookie exchange. I do wonder tho if anyone has tried to make ahead freeze them? Melt in your mouth good! Excellent recipe. These beautiful cookies are so delicious and so easy to make. Thank you for sharing this yummy recipe. No eggs in this recipe? These were delicious. I made them at Christmas and they were the best, so delicious yet so easy. I’m making them again for a friends birthday soon. They are delicious. But mine split and the jam runs out. What am I doing wrong?? Use the back of a teaspoon to make the “thumbprint” and be gentle. That helped me. Love these cookies! Been making this recipe for years. Always a hit. I’ve made these cookies the last few years and they’ve become a fan favorite. I have some dough chilling and I’m going to do some with raspberry jam and a few with just a simple pecan in the center. Simply delicious! This recipe has become a family favorite. These cookies are so delicious, they’re dangerous. You can’t eat just one. Great recipe. I just made these for the first time. Turned out delicious but took almost triple the time to cook? Also only yielded 20 cookies. Probably need to make the balls smaller. I LOVE making these every Christmas! They are a huge hit! If you have extra what I do is store them in an air tight container by themselves with parchment paper between each layer so they dont stick. If you are not eating them within a week freeze that container with the parchment paper:) Merry Christmas! I am just making these now .. I put dough in the fridge for an hour as recommended but I wish I hadn’t. Too hard .. now waiting for the dough to warm up before shaping into balls. I’ve made these cookies for Christmas for the last couple of years. They’re very easy and a crowd-pleaser every time. I just made these – but used coconut sugar and homemade “jam” (frozen blackberries and raspberries, honey, and a tad of cornstarch in a pot on the stove) for less sugar content. It worked well, and the cookies are delicious! I made these and baked as per the recipe and they spread out like crazy. I tried chilling the dough and also tried at 325 and 375, but no success. I am a real cookie baker and so, wondering why this may have happened. Hi, can I freeze the thumbprint cookies? Hi. hope you see this! :) first, is there a special sugar to sprinkle on top or just reg granulated? and my first try some were flat, any idea why? oh and when I make my ident the sides split a bit and I wondered if there was a trick /tip for avoiding that? thanks so much. they are delicious!! Should I use salted or unsalted butter? Or does it not really matter? Could I put the dough through a cookie press? Maybe not chilling before? I just made these cookies and I have to say I found the almond extract WAY to overwhelming and too strong a flavor. I could barely taste the raspberry filling. So, I attempted again using a half a tsp of lemon extract in the cookie dough and just a few drops of lemon extract in the glaze and it worked out perfectly! I find that the lemon and the raspberry compliment each other quite well and is more to our taste. Thank you for a good base for me to start from. This is one of the most delicious cookies I have ever tasted. They are bakery quality. Without fail, everyone who tastes them, asks for the recipe. I LOVE these cookies! Just a quick tip, I found that using my thumb to make the indent made a “ramp” more than in indent. I used the back of my teaspoon or 1/2 teaspoon. It gives the perfect round and even indent. Thanks for the amazing recipe! I really love all these recipes for the holidays. I have only one wish and that is for the listing of how many cookies the recipes make. It says 36 cookies at the top of the recipe. What brand of jam do you use/recommend? I don’t usually use jams or jellies so I have no idea where to start. I have made these for years-I think I found it in a print ad for butter. They are delicious and very easy to make. Will make again this year for Christmas-a pretty cookie that tastes great. hmmm… I made these last year…going to make them tomorrow again.. but mine went straight into the freezer and I just took out what I needed when I needed them. They were fine. HI Ann, Im thinking about doing this recipe for a cookie exchange, the reality is i will probably have to freeze some, Im likely making them on wed, Thursday to deliver on monday? Your froze fine? made these cookies & they were wonderful! the only problem I found is how 2 store them; it was a warm day when I made them so I put them in the fridge & that wasn’t a good idea (2 hard) cookie tin made them 2 soft. any suggestions?